The rendering, apparently from a case maker, arrives less than a day before Apple is anticipated to unveil a redesigned iPad Pro at a special media event in New York City. 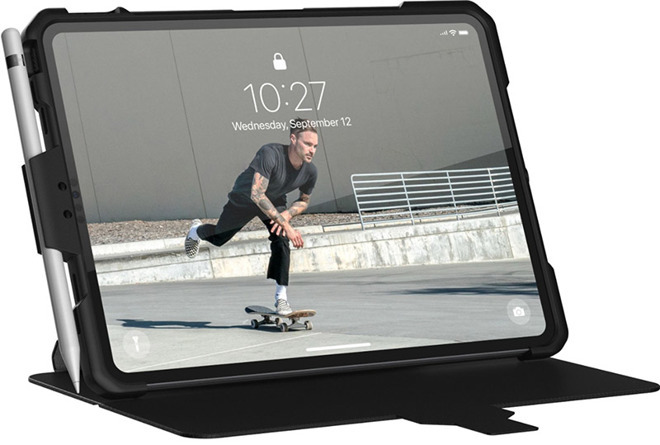 If the image is a faithful rendition of the device Apple intends to release this week, the next iPad Pro will hide a TrueDepth camera array in a top bezel that appears to be just as thick as both sidewalls and bottom bezel. Previous versions of the tablet boast larger "forehead" and "chin" areas that flank the top and bottom of the screen when iPad is held in a portrait orientation. The extra space affords room for Touch ID and a front-facing camera, two components rendered obsolete by TrueDepth. Though some fans believed Apple would bring the (in)famous TrueDepth notch over to iPad, the idea was never fully baked. Unlike iPhone, where both internal and external headroom is at a minimum, iPad presents a much larger palette onto which Apple can add new hardware. Today's image lines up with a mountain of rumors suggesting Apple will move its tablet platform from Touch ID to TrueDepth and Face ID this year. Earlier this month purported renderings also showed off a slim-bezel design with no Touch ID. Schematics included in the previous leak point to a squared-off aesthetic akin to iPhone SE, perhaps a consideration for fitting the TrueDepth component stack into the tablet's already thin silhouette. Analysts and industry watchers expect the next iPad Pro models to come in 10.5- and 12.9-inch sizes and feature faster "A12X" processors. Beyond Face ID, Apple is also expected to replace Lightning with USB-C, a major shift that — along with a redesigned Apple Pencil — could help the tablet gain traction with creative professionals. AppleInsider will be on the scene live at Apple's Oct. 30 event in New York City. Follow our live blog to stay up to date with late-breaking news.